While vocal effects chains in a DAW can fix a lot of unwanted blemishes in a recording, it’s much easier to get the vocals done right from the start so that less editing is required. While other vocal patterns have their particular uses, if you are recording a song (or podcast) with one person on the microphone at a time, you want Cardioid microphone. If the microphone has several settings, choose Cardioid. Cardioid mics will detect the most sound from the front, some from the sides and very little from behind. Use a pop filter (or wind screen) to block air plosives. A pop filter (or wind screen) to block air plosives. 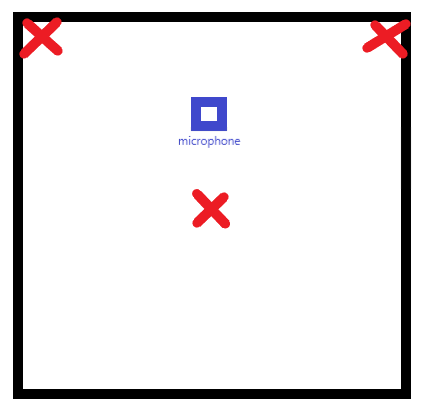 Another benefit of a pop filter is to set an appropriate recording distance: setting a boundary so the vocalist can’t get too close, and visual reminder if they’re recording too far. If the mic is positioned on a stand that might accidentally shake some some reason (i.e. the vocalist accidentally kicks the stand with their foot), then a shock mount is also recommended. You want to place the microphone where the sound waves have the least amount of reflections. Not in the corners, but not in the dead center either where it could bounce in all possible directions. An off-center location is preferred. Regardless of how good your microphone is, it will sound bad if your recording environment has a lot of hard surfaces. It will collect a lot of reverb before entering your DAW. Buy acoustic panels, or use pillows/blankets/clothes/other soft materials to absorb the sound. Why is reverb (from recording environment) bad, yet audio engineers add reverb effects on the DAW anyway? Because having a clean set of vocals allows the mixer to manipulate it anyway you want (i.e. alter the size, width, strength of the reverb) whereas vocals artificially colored by your surroundings forces the vocals into a sonic direction that can’t be undone.don’t need it at all). Sound treatment is best placed on the walls that are behind and beside the microphone. If your floor is a hard surface, a rug may help. The appropriate distance is subjective and dependent on the project. You want to go for an up-close, intimate sound, to speak to the listener personally and directly. You want to go for an energetic soulful sound that has space to breathe. The proximity effect of microphones adds extra bass and warmth to the voice when you are close to it. For radio, podcasts and broadcasts in general, this is preferred. For songs, how much proximity effect you want depends on what kind of sound you want achieve. If you are using a Dynamic mic (as opposed to a Condenser), you want to be closer the mic. And don’t sway too far away from it because the vocals can become extremely quiet all of a sudden. Listen to the live playback of your vocals before you record the real recording to check if the gain level is appropriate. If the gain is too high, the vocals will clip, resulting in disortion and lost information when the vocalist gets loud. If the gain is too low, there will be a point where you can’t restore it to acceptable just by making it louder in the mix. If you are hearing background noise (from your environment) or white noise (from your audio interface), then your gain is probably too high. If you are recording vocals (on top of an instrumental, or instruments in general, you can also gauge it visually. While your ears will detect mixes much better than your eyes, you can immediately use the visuals on your DAW to tell when something is too loud or quiet. On this test recording, we can clearly see Vocals #1 is way too small and Vocals #3 looks way too big. Vocals #2 is still a bit on the quiet side, but in the mix, I can make the instrumental a few db quieter and the vocals a few db louder to fix the track, whereas 1 and 3 are unfixable. With Vocals #3, the sound waves approach the top of the row and it flattens; this is clipping and we generally don’t want it. I want to stress the importance of doing a quick test run before recording the actual song. Spend a little time familiarizing yourself with your mic, interface and recording environment so you know by heart what gain/distance is appropriate for what moment. If recording another person’s voice, hear a live playback of their voice first, even if it’s just a quick test recording or casual conversation. Get a feel for how much gain they need. It’s better to establish this from the start than to have the embarassment to ask them to record the entire take again because you didn’t record them correctly. If you or the person you are recording is not happy or relaxed, the recording is going to come out stiff. Control the environment as much as you can. Room temperature, balanced lighting, tasteful decoration, comfortable seating, water bottles for thirst, etc. Next articlePersonal Top 10 Cards from Pokemon Black & White!